Inbound for Shieldhall with a cargo of grain from Bordeaux, Arklow Shipping's ARKLOW VIKING was seen as she passed McInroy's Point. 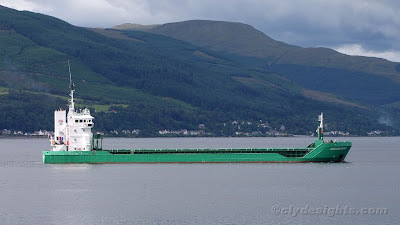 ARKLOW VIKING flies the Dutch flag, and was built for the company in 1999. She has a deadweight of 4,940 tonnes and is 89.75 metres overall.